Explore the best of the region on our Highlights of Rajasthan tour, soaking up splendid lake palaces, majestic forts, colourful bazaars, and dreamy desert landscapes. After arriving in Delhi, our suggested itinerary takes you to the fairy-tale city of Udaipur, for a two-night stay at the unashamedly opulent Oberoi Udaivilas on the banks of Lake Pichola. In Udaipur, you’ll take in the gargantuan City Palace, shimmering lakes, and the crooked narrow streets of the old city. From Udaipur fly to the Pink City of Jaipur, where the regal Oberoi Rajvilas will be your base whilst exploring highlights such as Amber Fort, the City Palace Museum, and the Hawa Mahal. You’ll also have a day at leisure in Jaipur to hit the colourful markets and emporiums, bursting with rich textiles and unique local handicrafts. Journey through the Aravalli hills to the Blue City of Jodhpur, for a two-night stay at Raas – a fabulous boutique hotel nestled in the heart of the old city. With magnificent views over the Mehrangarh Fort, a zen-like spa and stunning suites, Raas is one of our favourite places to stay in Rajasthan. Whilst in Jodhpur, you’ll explore the majestic Mehrangarh Fort and Jaswant Thada, take a walking tour through the labyrinthine streets of Sadar Bazaar, and head out to the nearby Bishnoi villages by Jeep. 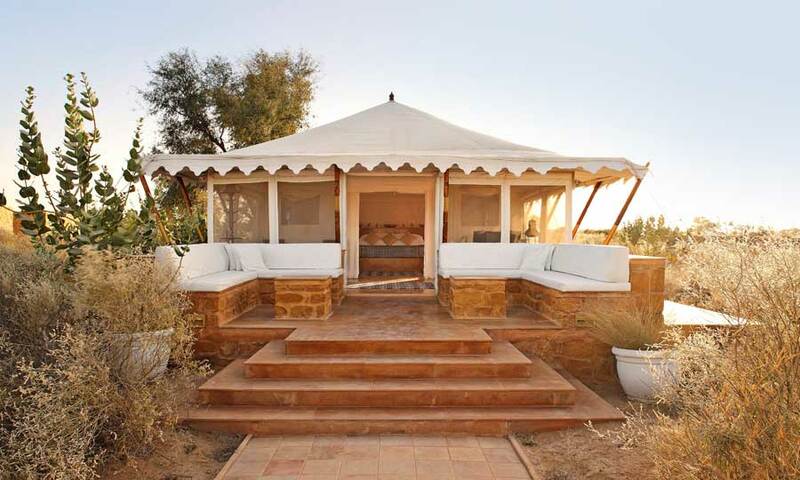 You’ll then continue to Jaisalmer, in the heart of the Thar Desert, for a two-night stay at The Serai – a luxury desert camp seemingly in the middle of nowhere and surrounded by golden sands. 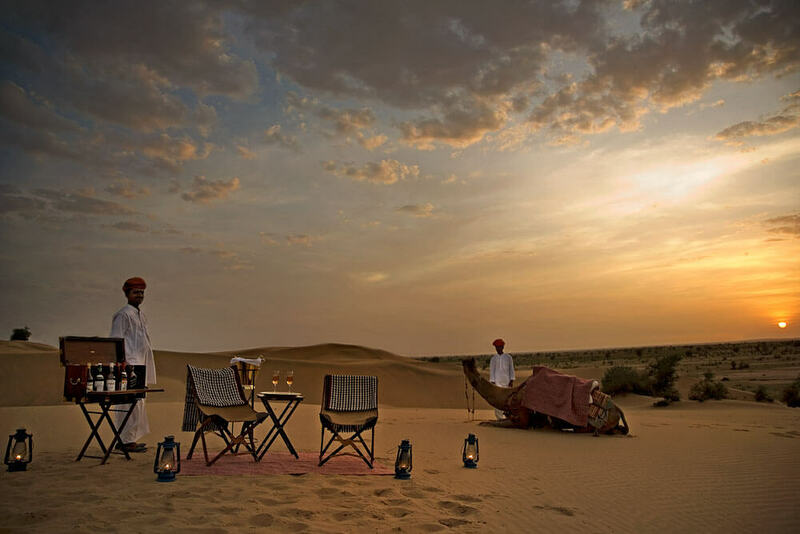 A camel ride to the dunes for sundowners will make for a fabulous memory of your time in Rajasthan. The next day you’ll head into the city to discover the fort. Rajasthan’s only remaining living-fort, the complex has a dizzying array of houses, temples and havelis all crammed within its narrow streets. Your journey through the highlights of Rajasthan kicks off upon your arrival in Delhi, where you’ll be met by a member of our team at the airport and chauffeured to the Oberoi Gurgaon for an overnight stay. The luxurious Oberoi is one of the capital’s finest hotels and has striking architectural features like their huge blue reflection pool. Interiors are cool and crisp, with acres of glass and mirrors, dramatic red flower arrangements and bespoke art pieces. Take it easy for the rest of the day to relax and recuperate from your international journey. Depending on the time you land, if you’d like to explore a bit of Delhi later today your chauffeur is always on hand. After breakfast this morning you’ll head to the Pink City of Jaipur, in the heart of Rajasthan, for a three-night stay at the Oberoi Rajvilas. There are not many hotels in the world where check-in involves a brightly painted elephant and a fragrant shower of rose petals, but then again the Oberoi Rajvilas does not settle for anything less than spectacular! The resort is almost a destination in itself, with sprawling gardens and a 250-year-old Hindu temple in the grounds. 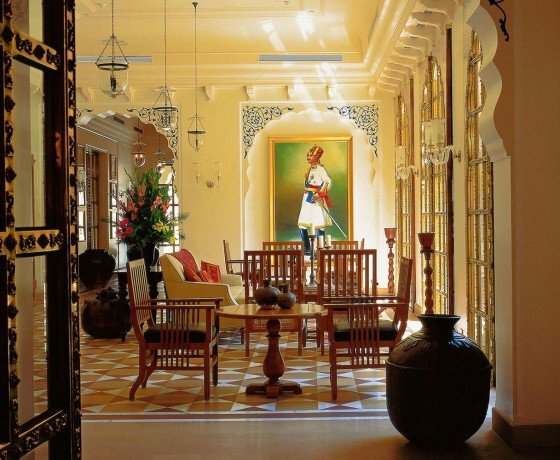 The signature Oberoi service is attentive, yet unobtrusive. The Oberoi Rajvilas even employ a handful of staff with the sole responsibility of shooing pigeons from the pool! One of the finest hotels in Rajasthan, the Oberoi Rajvilas is a great choice for those seeking luxury and a royal experience. A full day of guided sightseeing will show you the best of Jaipur. Climb Amber Fort by elephant before continuing to the City Palace Museum. You will also visit the Jantar Mantar observatory, along with Hawa Mahal (Wind Palace) and Jal Mahal (Water Palace). This evening, there is the option of a private cooking class – alternatively, retire to the Oberoi Rajvilas and enjoy a dip in the pool. The day is free in Jaipur to relax and enjoy the resort, or further explore at your own pace. Your chauffeur is always on hand to take you anywhere you may like to go. We’d suggest hitting the vibrant bazaars and emporiums today to shop for souvenirs. Jaipur is well known for its beautiful jewellery, unique local handicrafts, colourful textiles and interesting nick-nacks. 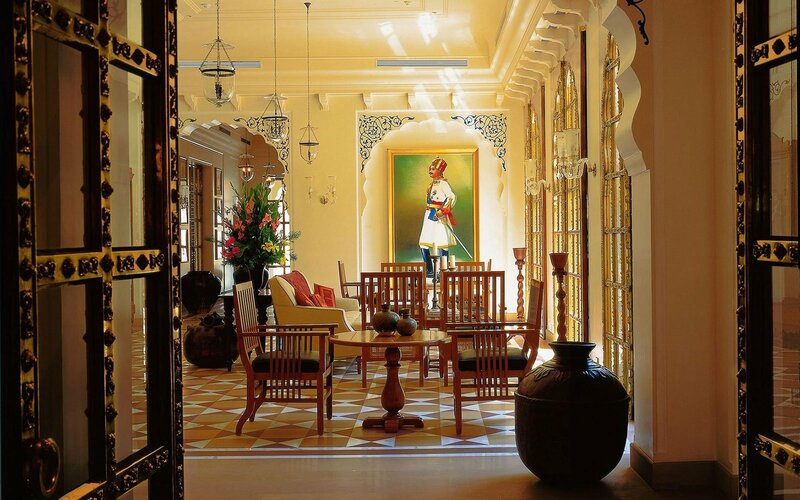 Board a morning flight down to the romantic city of Udaipur, for a two-night stay at the Oberoi Udaivilas. Alternately, you may prefer to drive, and we encourage you to let us know your preference (though flying will get you there quicker, driving allows you to soak up the rural countryside and make interesting stops en-route, such as the battle-scarred Chittorgarh Fort. Or, spend a night or two off the beaten track at Dev Shree, Deogarh). Resting on the banks of Lake Pichola, the Oberoi Udaivilas is the definition of luxury and something straight out of a fairy-tale. Utterly grand and unashamedly opulent, it was ranked as the ‘Best Hotel in the World’ by readers of Travel + Leisure magazine last year. Upon arriving, the remainder of the day will be at leisure to enjoy your spectacular surroundings. If you can tear yourself away from the exquisite Oberoi Udaivilas, you’ll be accompanied by your guide to explore the city of Udaipur. To begin, a walking tour through the narrow streets of Udaipur’s old city will take you through winding streets teeming with shops selling clothing, silver jewellery, and leather-bound journals. You’ll shortly approach the City Palace – this sprawling palace is the largest in Rajasthan and stands on a ridge overlooking the lake. Cupolas crown its octagonal towers, which are connected by a maze of narrow passageways. The rooms inside the City Palace all contain decorative art: beautiful paintings, colourful enamel, inlay glass-work, and antique furniture. You’ll also explore the 17th century Jagdish temple, the Crystal Gallery, and Saheliyon-ki-Bari (a beautiful rose garden), before ending with a sunset boat ride on Lake Pichola, in the Oberoi Udaivilas’ charming shikhara. Continue to Jodhpur on a scenic drive through the Aravalli hills. En-route, make a stop in Ranakpur to explore the exquisitely carved Jain temples. For the next two nights, you’ll stay at Raas – a stylish boutique hotel nestled at the foot of the mighty Mehrangarh Fort, in the heart of Jodhpur’s old city. Stepping away from the buzz of the old city and walking through Raas’ stunning gateway is like entering a peaceful oasis. The hotel is a beautiful contrast of old and new; slick décor and modern structures stand side by side with a restored, red sandstone haveli. The view of the fort looming above is spectacular, perhaps one of the best hotel views in Rajasthan. A guided tour of Jodhpur today takes in Jaswant Thada, Mehrangarh Fort, and the crooked narrow streets of the Sadar Bazaar (best explored on foot, bicycle or rickshaw; do let us know your preference, as every detail of your tour with us will be designed around you). After lunch, head to the sandy outskirts by Jeep on a safari to the nearby Bishnoi villages. The arid countryside south of Jodhpur is dotted with villages, their mud and thatch huts inhabited by the Bishnois and communities of potters and weavers. A tour of this area provides a memorable opportunity to observe the rhythm of daily life in these hamlets, experience the warm hospitality of the villagers, and see beautiful traditional crafts being practised. Your journey through the highlights of Rajasthan continues into the Thar Desert today, for a two-night stay at The Serai. 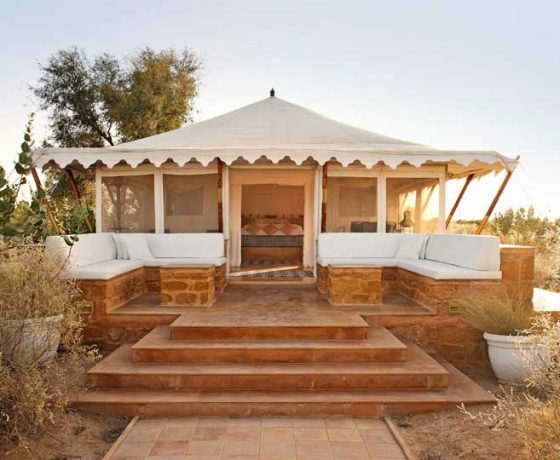 This oasis in the desert offers 21 luxury tents, though the word ‘tent’ is a bit of a misnomer; each offers a private veranda, a drawing room, and an en-suite shower room. Combining locally sourced products, such as traditional dhurries (rugs) and Jaisalmer stone tiling, with state of the art technology, The Serai offers all the facilities one would expect of a luxury hotel whilst remaining at home in the surroundings. If you wish, check out our recent stay at The Serai by clicking here. Accompanied by our guide, you’ll begin exploring Jaisalmer’s gargantuan fort. It rises like a fabulous mirage out of the sands of the Thar Desert, the awesome contours of its 99 bastions softened by the golden hue of the stone. After the fort, Jaisalmer’s havelis (intricately carved houses) are its greatest attraction. Built in the 19th century by the town’s merchants and ministers, these mansions dominate its labyrinthine lanes. The havelis of Salim Singh, Nathmanji and Patwon are the finest examples of this type of architecture, their golden stone facades so finely carved that they could be made of lace. This afternoon, retire back to The Serai for an exhilarating Jeep safari through the arid desert landscapes, culminating with a sunset camel ride and Sundowners on the dunes. This morning you’ll be chauffeured to Jaisalmer airport to board a short domestic flight back to Delhi. Alternatively, for those who’d like to experience the Indian railways, you can instead travel back to Delhi by overnight train. Upon reaching Delhi you’ll return to the Oberoi Gurgaon for a last night. The remainder of the afternoon is yours at leisure with your car and driver on hand. Today you’ll be chauffeured back to Delhi airport in time for your onward flight. Last night’s stop is completely optional and can be refined to best suit your international flight plans. For example, you may prefer to connect from Jaisalmer to your onward destination. Or, if you have a bit more time to hand in Delhi, a more centrally-located hotel (such as The Imperial) may be more suitable. Our journeys are inclusive of accommodation with breakfast, a private car with driver throughout, experienced guides, internal flights, entrance tickets and excursions. In other words, we offer a seamless and hassle-free experience where the only thing you need to worry about is soaking up the sights and enjoying your fabulous hotels! This indicative cost is based on a couple travelling between October 2018 and March 2019, sharing a double or twin room. The cost would reduce significantly during the low-season months of April to September, whilst it would be noticeably higher during the peak Christmas and New Year period. 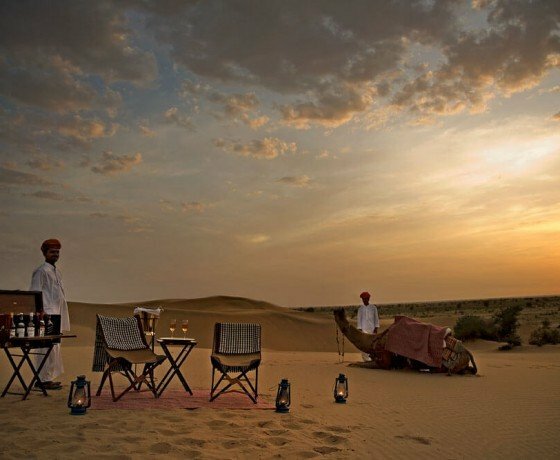 The Serai (the luxury desert camp in Jaisalmer) is closed from May to September each year – if you’d like to travel at this time, we’d recommend staying at Suryagarh instead, though the Rajasthan region, in general, is best explored between October and April. The Highlights of Rajasthan tour we’ve described here is merely a starting point to share a flavour of the possibilities, and absolutely every aspect is flexible (from the hotels, to the destinations, to the length, to the sightseeing). For example, you may like to stay a bit longer in Delhi in order to explore the highlights of India’s capital city; or, those with tighter schedules may want to omit Delhi entirely, in order to focus on Jaipur, Udaipur, Jodhpur and Jaisalmer. If you’d like to combine this with a visit to the stunning Taj Mahal in Agra, and spot tigers on safari in Ranthambhore, may we suggest our Ultimate Luxury Rajasthan Tour? Let us know what you’d like to create and we can make it happen!